Knee replacement is a surgical treatment designed and performed by orthopedic surgeon to help the patients who are suffering from Osteorthritis and other bony abnormality on the knee which needs replacement of the natural knee. 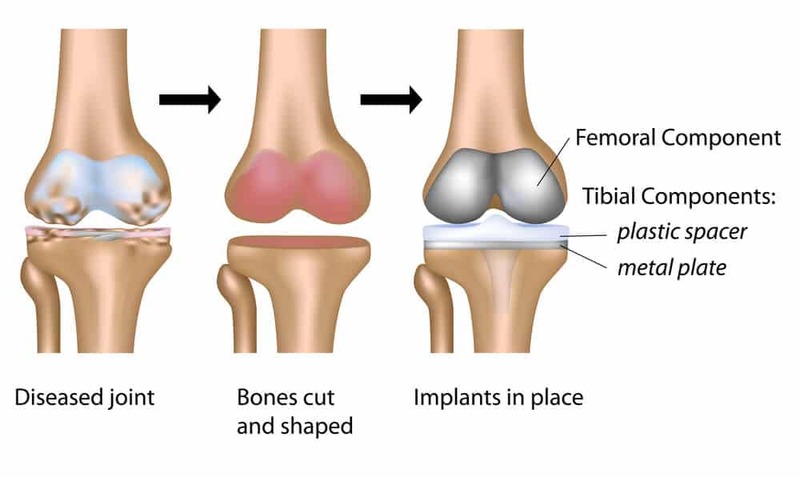 There are two kinds of knee replacement. Partial Knee Replacement – In partial knee replacement, the orthopedic surgeon will only replace the affected part of the knee which could be medial, lateral, or patellar. The advantage of this procedure is that you are able to keep other part of the knee which is not totally affected. Total Knee Replacement – For the total knee replacement, literally, the whole knee will be replaced with an artificial knee. The good thing about having a new knee is that you are now able to get rid of the excruciating pain symptoms. Additionally, you no longer have to have steroid injections and pain medications just to relieve the pain temporarily. However, always keep in mind that your knee isn’t returned back to how it has been when you were 20 years old. Your bones were cut and foreign material is attached. Although exercise and using this new knee is good for the recovery, there is always going to be accompanying bad results with overuse. Sports and other activities may be limited especially when it is demanding your knees too much. Some patients complain of discomfort after knee replacement especially when exposed to extreme temperature or when there is sudden change of temperature. What to expect after the knee replacement procedure? Pain medications – Given temporarily to manage the pain after the procedure. Anti-thrombosis medication – Usually after surgery to avoid having deep venous thrombosis. Infection – Be watchful for any signs of infection on the surgical site. This may include pain, redness, swelling, and sometimes pus discharge. Bleeding – As cuts were made, surgical site can bleed. This can also result from trauma or disturbance in the previously repaired surgical site. Falls – As balance is kept by one leg alone, one must be careful especially with ambulation. Deep Vein Thrombosis – Since your extremity mobilization is impaired as of the moment, you should be careful of possible deep vein thrombosis – doctors may prescribe blood thinners to help prevent such occurrence. Mobilization and physical therapy is needed. Make sure you have someone to assist you with wound cleaning and attending to your needs. After a few days, you may need to check with your doctor for follow up. You may need to have an x-ray to confirm the placement of the implant and how it is doing. In the rehabilitation process, you are advised to undergo sessions of physical therapy. With this, your progress is monitored and you will be reaching postoperative milestones appropriately.